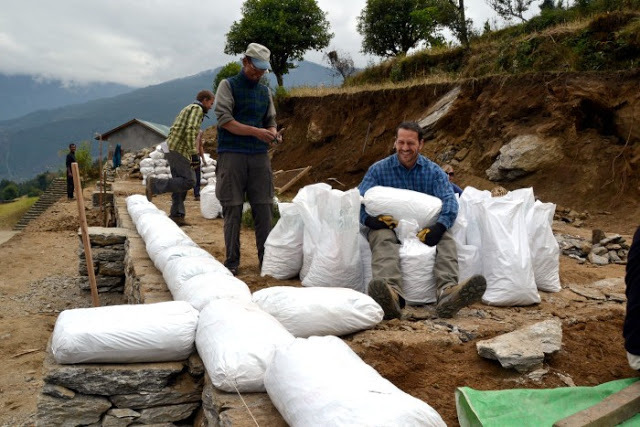 In an earlier blog post, we described the innovative building technique known as earthbag construction that is being used to build schools in the rural countryside of Nepal. We shared the details of our own earthbag construction project that we are designing with Edge of Seven. And we invited you to celebrate with us as we commemorate the transition for Sparky Millikin from TruexCullins Managing Principal to Himalayan mountain climber. Well, these is one more surprise we have in store. To build excitement for our earthbag construction project in Mankhu Village in Nepal, we are building a wall of our own in our offices at 209 Battery Street in Burlington. The “earthbags” will come together during Sparky’s retirement party on Thursday, May 9th. For a $50 tax-deductible donation to Edge of Seven, we will place your name on a polypropylene bag like the ones we will use to construct a new community center for Nepalese girls. As our wall rises, it will symbolize our collective efforts to lift up these girls out of poverty and raise opportunities for all. In Nepal, your donation will go far to educate and empower girls and break the cycle of poverty. Edge of Seven is a non-profit organization that works closely with local NGOs to ensure that all projects are carried out in a cost-effective manner. In 2010 and 2011, less than 10% of donations went toward administrative costs. And please join us on May 9 to celebrate Sparky’s lifelong career and support the work of the Edge of Seven in Nepal!